COME SEE US AT A LOCAL SHOW FOR A FREE VALUATION OF YOUR STAMP COLLECTION !!! We are proud supporters of Stampex International. Interested in saving money on Postage? John Curtin started the company in 1987 after leaving his position of Vice Chairman of the Royale Stamp Company. In 2008 James Leigh started working for the business and has quickly picked up a very good philatelic knowledge and the art of accurately valuing stamp collections. In 2009 he married my daughter and has gone on to be a tremendous asset to both the business and my family. Over the past 25 years we have grown into a business that attends over 40 stamp exhibitions per year and travels Internationally to find the best material for our clients. In that time we have a established a very strong client base in both the UK and abroad, and are able to handle almost everything stamp related. We buy extensively throughout Europe and the UK. 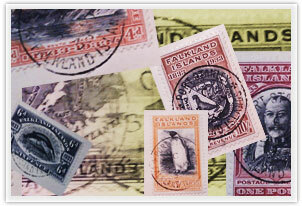 From auctions to collectors, to other dealers stocks, we will buy and sell almost everything philatelic! Great Britain – Collections, Singles, Covers, Booklets, Presentation packs etc. At Stampex we also carry a large range of nearly new empty albums and stock books that we sell at give away prices. EVERYTHING MUST GO! At present we do not sell our large stock of collections through our website, as we are constantly buying and selling new lots. If you would like us to look out for collections of certain countries on your behalf or you would just like to know what we currently have on the shelves please feel free to give us a call or come see us at one of our upcoming shows. We might just have exactly what you are looking for!